Commissioners are joined by executives from Design Within Reach and Duke Realty at the groundbreaking. 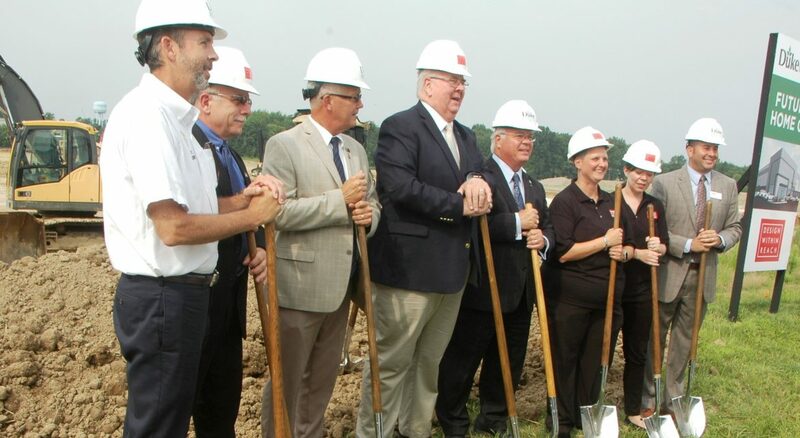 BATAVIA, Ohio – Clermont County Commissioners were joined today by executives from Design Within Reach and Duke Realty to celebrate the groundbreaking of a $17 million distribution facility at South Afton Industrial Park. It is the first property to be developed at South Afton, a 242-acre shovel-ready industrial park in Williamsburg Township owned by the Clermont County CIC with the intent of bringing more jobs to Clermont County. When Design Within Reach, a furniture and home accessories company, opens its new facility next year, it will employ 85 people with an estimated payroll of $3 million. The facility, at 617,760 square feet, will be the second largest industrial building in Clermont County, second only to the former Ford plant, which was built 37 years ago. The facility will be built by Duke Realty, which purchased 46.83 acres at South Afton on July 9. South Afton Industrial Park is on SR 32 and Half Acre Road. Executives at Design Within Reach praised the site’s proximity to a number of interstates and its markets in the eastern half of the United States. “We appreciate the commitment of Duke Realty and Design Within Reach to South Afton,” said Ed Humphrey, President of the Board of County Commissioners, after welcoming guests to the groundbreaking, including Bethany Kemp, Senior Vice President of Operations at DWR, and Dan Colletto, Vice President of Leasing and Development at Duke Realty. David Painter, Vice President of the Board of County Commissioners, praised the stakeholders who worked on this project. “Our partners have included Williamsburg Township, the Village of Williamsburg and the Williamsburg Local Schools. This team has made things work,” he said. “It’s also important to emphasize that our investment has created an environment that is attractive to the private sector,” Commissioner Painter added. “As government, we don’t create jobs, but we can help create an environment that will lead to new jobs. And that is what South Afton is doing. Commissioner David Uible noted that in today’s environment, manufacturers and distribution companies expect industrial land to be primed for development. “The fact is, manufacturing and distribution companies looking to expand want to come to turn-key industrial parks. They want the utility, water, sewer and fiber infrastructure already in place. They want the environmental studies completed and complied with. And if Clermont County isn’t prepared to offer them a site that checks all these boxes, they will find another county that is ready to do that,” he said. About South Afton Industrial Park: A 242-acre industrial park at the southeastern corner of State Route 32 and Half Acre Road in Williamsburg Township. 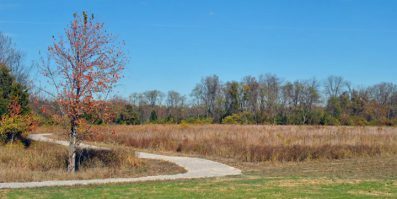 The land was purchased by the Clermont County CIC (Community Improvement Corporation) in February 2016 for $4.9 million, using proceeds from the Ivy Pointe development in Union Township. The CIC has invested $2.7 million in infrastructure at South Afton. An economic impact study by the Economics Center of the University of Cincinnati estimated that the industrial park would eventually create more than 1,800 direct jobs and more than 1,600 indirect jobs. Read more here: www.southafton.com. For more information on South Afton Industrial Park and this project, contact Adele Evans, jaevans@clermontcountyohio.gov, 513.732.7912. Duke Realty contact: Helen McCarthy, Helen.Mccarthy@dukerealty.com, 317.708.8010.